The Cereal Supply and Demand Brief provides an up-to-date perspective of the world cereal market. The monthly brief is supplemented by a detailed assessment of cereal production as well as supply and demand conditions by country/region in the quarterly Crop Prospects and Food Situation. More in-depth analyses of world markets for cereals, as well as other major food commodities, are published biannually in Food Outlook. Crop Prospects and Food Situation. This month’s global cereal supply and demand forecasts for the 2018/19 marketing season incorporate historical adjustments made to China’s cereal balances, which are significant, especially in the case of maize (as described in more details below). Consequently, the current forecasts for global cereal production, utilization and carryover stocks are different from those published in the March report. FAO’s current world cereal production estimate for 2018, incorporating Chinese historical production revisions, stands at 2 655 million tonnes (including rice in milled terms). Although this figure is 46 million tonnes higher than the previous month’s estimate, world cereal production is still down 1.8 percent (48.8 million tonnes) year-on-year, largely on account of lower maize and wheat output figures that more than offset increases in rice and sorghum production. The forecast of global cereal utilization in 2018/19 has also been raised to 2 683 million tonnes, up 1.2 percent (32 million tonnes) from March and 1.1 percent (28 million tonnes) from the 2017/18 level. The bulk of this month’s revision again stems from the upward adjustments made for China. World wheat utilization in 2018/19 is set to reach an all-time high of 748 million tonnes, some 0.8 percent (6.3 million tonnes) above the previous forecast and 1.2 percent higher than in 2017/18. The increase from last month reflects higher estimates not only for China but also for the Russian Federation, while the year-on-year expansion is largely driven by rising food use and strong demand in Asia. Mostly because of higher maize utilization estimates for feed in China, the latest forecast for 2018/19 global total utilization of coarse grains has been raised from the previous month’s estimate by 1.7 percent (24.3 million tonnes) to 1 425 million tonnes, representing a 1.1 percent increase from 2017/18. World rice utilization in 2018/19 is pegged at 511 million tonnes, up slightly from March and 0.8 percent (4.1 million tonnes) from 2017/18. FAO's new forecast of global cereal stocks for crop years ending in 2019 has been scaled up since the previous report by almost 11 percent (82 million tonnes) to 849 million tonnes, largely reflecting revisions to maize, wheat and rice inventory estimates in China. 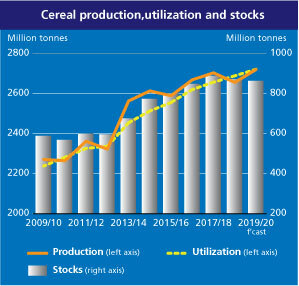 While historical levels have been revised upwards, world cereal stocks in 2018/19 are expected to decline by 2.9 percent from their opening levels, resulting in a drop in the ratio of global cereal carryovers to utilization (stock-to-use) from a relatively high level of 32.6 percent in 2017/18 to 30.7 percent in 2018/19. The forecast for global wheat stocks, though raised by 2.3 million tonnes from last month to 267 million tones, still points to a 5.0 percent reduction from the record opening level, mostly on drawdowns in the EU and the Russian Federation. For coarse grains, the forecast for global stocks has been lifted from last month by 76 million tonnes to 400 million tonnes, but still 4.3 percent below their opening levels. The sharp change in this month’s forecast mirrors the upward revisions to inventories in China and to a lesser extent in the EU, South Africa and the United States. World rice stocks at the close of 2018/19 are predicted to reach an all-time high of 181 million tonnes, up 3.8 million tonnes from March and 6.9 million tonnes higher than their opening levels. This month’s global rice inventory adjustment reflects higher estimates for China, but also an upward revision to carry-overs in India, given expectations of a bumper crop in 2018 and a strong pace of public domestic procurement in the country. FAO’s forecast for world trade in cereals in 2018/19 has been lowered marginally since last month to 412 million tonnes, down 2.2 percent from 2017/18. World wheat trade is pegged at 170.5 million tonnes, almost unchanged from March and down 3.6 percent from the previous season’s peak. At 195.0 million tonnes, total trade in coarse grains is seen heading to a small contraction from 2017/18, with reduced import demand for barley and sorghum more than offsetting bigger maize purchases, especially by the EU and several countries in Asia. World rice trade in 2019 is set to contract by 2.6 percent to 46.6 million tonnes, down 500 thousand tonnes since March, with lower expected exports by India accounting for most of the downward revision. For the 2019 crops, FAO’s forecast for world wheat production remains unchanged from last month at 757 million tonnes, which would place this year’s output 4 percent above the 2018 level. The bulk of the expected year-on-year gain is linked to the favourable production outlooks in Europe, where the confluence of generally beneficial rains and higher plantings are expected to drive up production in the EU, the Russian Federation and Ukraine. In the United States, wheat output is likely to remain close to the previous year’s level, while an expansion in spring plantings in Canada is forecast to instigate higher production. In Asia, prospects for 2019 remain unchanged this month, with production in India expected to be close to the 2018 record level, while in Pakistan reduced water availability, despite recent heavy rains, is foreseen to curb the country’s output. In the southern hemisphere, preliminary prospects point to a strong recovery in Australia’s output and a nearly unchanged production in Argentina. Regarding coarse grains, while harvesting of the 2019 crops in the southern hemisphere countries has commenced, countries in the northern hemisphere are still in the land preparation stage. In Southern Africa, localized dry weather conditions in some areas, as well as recent heavy rains and flooding in others, have lowered production prospects across the sub-region. In South America, reflecting larger plantings and beneficial weather conditions, maize production in key producing countries, Argentina and Brazil, is expected to rebound from last year’s reduced levels. FAO’s adjustments to supply and demand figures for China reflect official Chinese revisions to historical production estimates of wheat, maize, rice and several other commodities, released by the National Bureau of Statistics of China (NBS) in October 20181. These were the result of China’s 2017 agricultural census, which covered the 11-year period spanning from the previous agricultural census in 2007 to 2017. The revised NBS data indicate that total cereal production in China between 2007 and 2017 was, cumulatively, around 312 million tonnes higher than earlier reported, of which 266 million tonnes correspond to maize, 25.6 million tonnes to paddy and 20.6 million tonnes to wheat. The increases were mainly attributed to a larger planted area, although yields were also raised slightly. The fact that there were no corresponding official revisions to the other elements of China’s cereal supply and demand balances, namely utilization and stocks, rendered accommodating the newly reported production series a challenging task. In recent months, FAO and the G20Agricultural Market Information System (AMIS), in close collaboration with the Chinese Academy of Agricultural Sciences (CAAS), experts from other agencies, as well as the private sector, undertook a major review of China’s cereal balances to derive an up-to-date picture of China’s cereal supply and demand dynamics. This process underscored the importance of improving the accuracy of Chinese feed use estimates, primarily in the case of maize, in order to improve the quality of the country’s stock figures, considering that the latter are derived as a residual in the supply-utilization balances. For this reason, a comprehensive assessment was undertaken, reviewing all aspects of feed demand in China, taking into account livestock and aquaculture inventories, feed requirements, sector intensification and feed efficiency. Guided by this process, FAO’s forecast for total cereal feed utilization in China in 2018/19 has been raised from 181 million tonnes to 194 million tonnes, while carryover stocks were raised by 78 million tonnes to 422 million tonnes. Maize accounted for the bulk of this revision, with the commodity’s feed use raised by 15 million tonnes to 165 million tonnes and stocks lifted by 73 million tonnes to 195 million tonnes. A twelve-year series of China’s maize, rice and wheat balances (old and revised) is available below. Although the bulk of FAO’s revisions entailed significant increases to Chinese supply and demand figures, starting from 2007/08, the need to maintain a consistent series required to review and revise the balances all the way back to the 1980s. Nonetheless, given the absence of official information or surveyed data on feed and stocks, China’s supply and demand balances could still evolve and will continue to be closely monitored.